My latest round of dyeing featured blue violet, golden yellow, and strongest RED. It also involved experiments with tapioca resist dyeing, shaving cream dyeing, and lace painting. And here’s my first red. 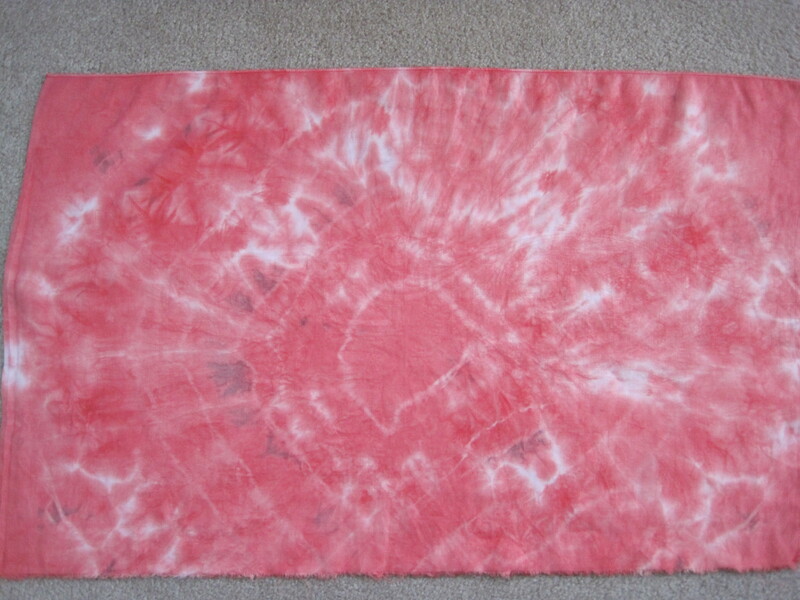 This was done by rubber banding my gathered up fabric in four or five places and then soaking it in strongest red dye for about 22 hours. It kind of looks like a spider web on top of the fabric. I’m calling my tapioca resist experiment a total failure. 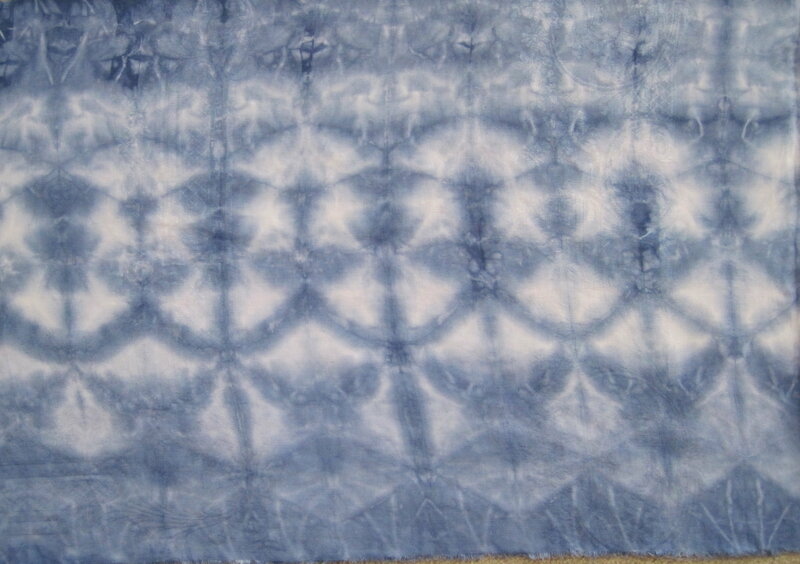 Maybe overdyeing can rescue these squares. 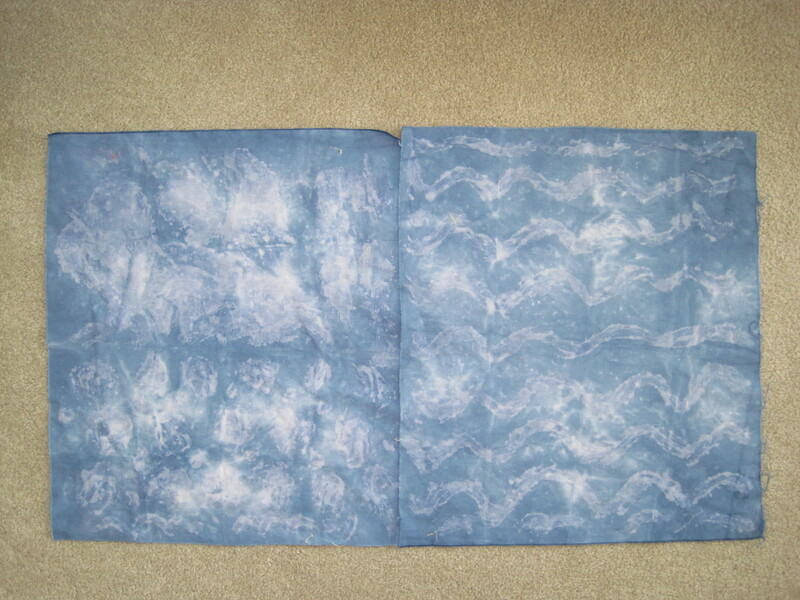 You can see the pattern a bit on the right hand fabric, but this technique is messy and not worth repeating. There are bits of blue violet tapioca in my grass where I hosed off these fabrics. My favorites I’ve saved until last. First up is a blue violet folded arrangement on a piece of old damask tablecloth. I’ve found this cloth doesn’t give crisp dye lines but its woven pattern can interact nicely with dye. And here’s the result of stacking blue violet and strongest red. I have no idea how the crystalline shapes occurred, but I like them. With this technique, you put a bit of dye into a container, scrunch up part of your fabric into the dye until it’s absorbed, then scrunch more fabric into the container, and pour on another dye color or colors. Sometimes the colors merge and form a third color. At the edges of this piece the colors blended into a lovely deep purple. My dyeing buddies were busy painting bits of lace with dyes, and then rinsing the lace off to make the colors delicate pastels. Maybe they’ll take picture of their results so I can post them. I don’t know what my next dyeing adventure will be. 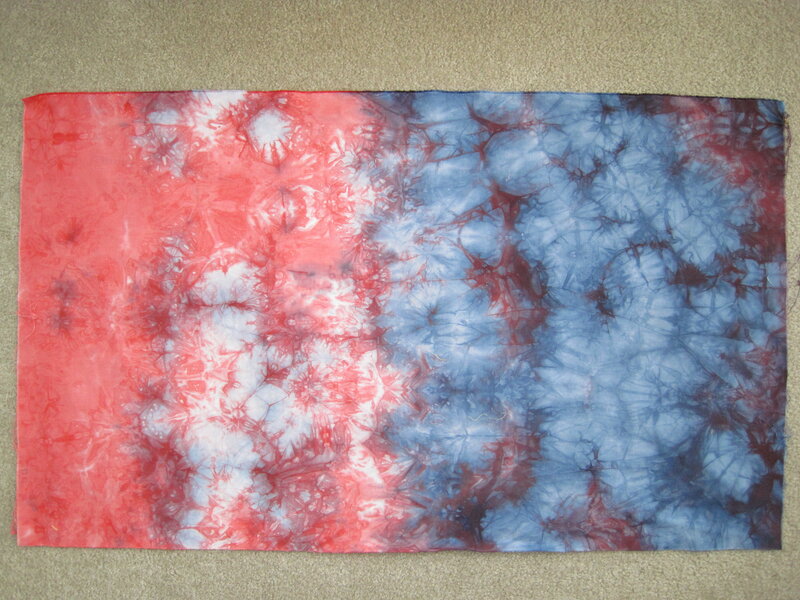 I have some yardage I want to overdye, and would like to try more resists and possibly sun dyeing. So many choices, and that’s great.